Published on March 2, 2017 by Martyn. Be the first to comment! 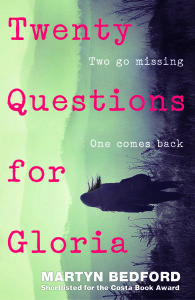 I’m delighted to announce that Twenty Questions for Gloria has won the 13+ ‘Simply the Book’ category in the 2017 Coventry Inspiration Book Awards. My heartfelt thanks to Coventry Schools Library Service for organising the awards, to the librarians and teachers who supported them, and, of course, to the hundreds of students in participating schools across the city who voted for my novel. I’m really looking forward to attending the prize-giving celebration event in the summer and to meeting everyone involved. To find out the winners in the categories for other age groups please click on this link to the awards website.